Devastating weather in the Midwest after a "bomb cyclone" triggers catastrophic flooding. Evacuations as entire communities are underwater. We have the latest. Jessica Macholan, she and her husband farm cattle, corn and soybeans on their Nebraska farm. Mayor Shawn Kelly, mayor of Missouri Valley, Iowa, where 1,000 of the city's 3,000 or so residents had to evacuate last Thursday. CNN: "Opinion: 'Bomb cyclone' is more than clickbait" — "Say what you will about weather being mundane small-talk, but it has a flair for inspiring dramatic ways to describe it. The term snowmageddon seems to show up every year these days, but there's also snOMG, snowpocalypse, polar vortex and now the bomb cyclone. "Of course, this begs the question: Is the bomb cyclone a real thing, or just a bit of clickbait hyperbole? The foreboding moniker became famous last winter when the Northeast was hit with a powerful snowstorm and has re-emerged in the last few days as another storm bears down on the middle of the country. As those who have witnessed these tempests can attest, a bomb cyclone can indeed be a severe weather event. It usually comes with incredibly strong winds and very substantial precipitation. If one's heading your way, it is completely reasonable to make appropriate preparations. Just take a look at some of the footage from the Denver airport. "But just what is a bomb cyclone and how are they made? Well, they're not new and they're probably not quite as dangerous as the name sounds because, well, "bomb" sounds super scary. Typically, a bomb cyclone occurs when cold winds blowing over land collide with warm ocean breezes. This causes a very fast drop in pressure and the result is kind of a cold hurricane." Forbes: "Four Lessons From 'Bomb Cyclone' Flooding In The Great Plains" — "The 'bomb cyclone' dominated headlines last week, but the flooding it caused in the U.S. Great Plains did not initially. Many communities, homes, and businesses in Nebraska and other parts of the Great Plains were literally underwater. Levees were breached causing some rural towns to be completely isolated. 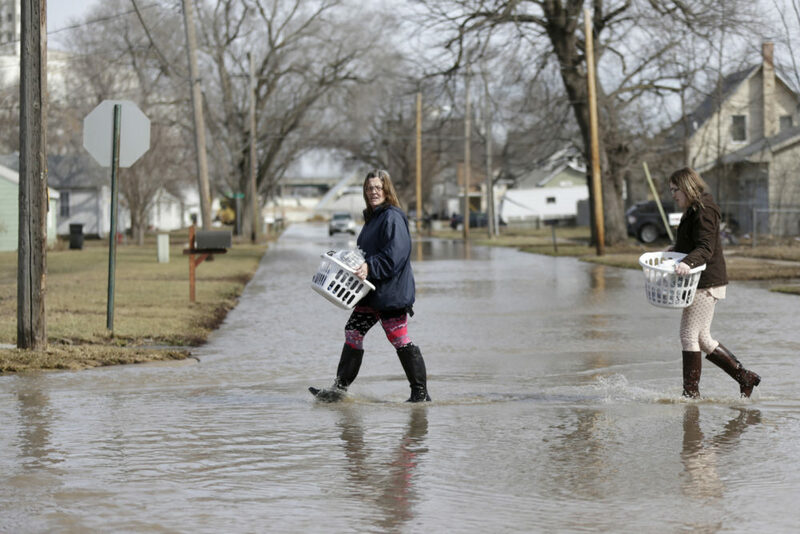 Flooding was so bad that the National Weather Service had to abandon its offices in the region, and Offutt Air Force Base, home of the U.S. Strategic Command, was partially submerged. I convened a virtual panel of experts to gather perspective on the forecast, the messaging, and perceptions about this event. Four lessons emerged." Wasington Post: "‘Maybe it’s a sign from God.’ Midwest floods devastate Nebraska farmers." — "Anthony Ruzicka, a fifth-generation Nebraska rancher, got the call at 6 a.m.: The nearby 90-year-old Spencer Dam was failing under pressure of a river swollen with snowmelt and rain. He got out with moments to spare — but the wall of water swallowed up many calves and all his bulls, along with his farmhouse, outbuildings, feed bins, and the original log cabin built when his family came from Czechoslovakia to homestead in the 1860s. "Ruzicka was luckier than most caught in the historic floods across the Midwest. The day before, he and his neighbors in Verdigre, in the northeast corner of Nebraska, had chased most of his herd of 300 cattle a half mile to higher ground, just in case. He doesn’t yet know his total fatalities, but on Saturday alone he saw 15 carcasses. "And losing so many calves and bulls? Calves represent next year’s cash (it takes 12 to 18 months to reach slaughter weight) and bulls represent genetic material that may distinguish the quality of a herd from someone else’s. "'I’m 39 years old; I don’t have children. The cows are my children, and my farm is completely destroyed. Maybe it’s a sign from God to go and do something else,' Ruzicka said. "Even before the 'bomb cyclone' and last week’s floods, the farm economy has been terrible, Ruzicka said. Most ranchers he knows are doing their best to break even, working 100-hour weeks and getting up every two hours to check the cows." This program aired on March 20, 2019.